Just in case you were worried that the robot uprising was delayed, fear no more. 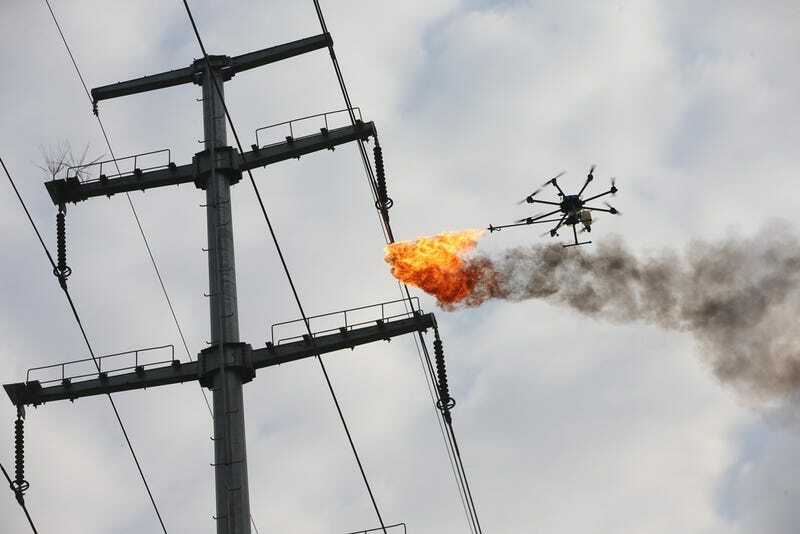 It appears to be right on time, as these fire-spewing drones are sent to burn off trash that gets stuck on high-voltage wires. The drones are being used by an electric power maintenance company in China to get rid of plastic bags and other debris that get caught in places that are hard to reach with a human in a cherrypicker. Now, before you get all worried about drones like these being used to kill humans, just remember that drones are already being used to kill humans practically every day. Targeted US military strikes against suspected terrorists occur on a regular basis, and terrorists themselves have gotten into the drone game. Some reports indicate that terrorist groups such as ISIS are trying to figure out how to deliver chemical weapons via drone. Flame-shooting drones would be tame by comparison. So when you see headlines like “It’s only a matter of time before a drone kills someone,” it’s important to remember that that time has already come. Let’s not sugarcoat it. We haven’t heard reports about anyone burned to death by this particular style of drone, but that doesn’t mean it hasn’t happened yet. Don’t live in fear about the future. The future is already here.